There has been much speculation among scientists and some hydrocarbon industry professionals in Japan about the existence and size of methane hydrate in marine sediments adjacent to Japan. Like speculation elsewhere (Kvenvolden, 1993), one of the biggest stumbling blocks has been the lack of basic knowledge about hydrate. Over the recent past, however, particularly since the mid-1980s, knowledge concerning naturally occurring oceanic hydrate has been greatly improved. In addition, hydrate began to be manufactured in test apparatus for acoustic, thermodynamic, and other material science testing. A considerable body of hydrate data now has documented by many researchers. Hydrate volumes have been estimated in many places in the world, as the aerial and vertical distribution of methane hydrate is usually estimated primarily on theoretical conditions (Collet, 1998) and by interpretation of seismic studies (Chapter 22). From a resource point of view, previous studies of such hydrates have been mostly restricted to resource assessment (Kvenvolden, 1988; Krason, 1993; Lee et al., 1993). On the other hand, recent studies or discussions are more related to gas recovery (Hovland et al., 1997; Max and Dillon 1998). Many technical and scientific papers related to methane hydrate, including those dealing with the likelihood of hydrate adjacent to Japan, have now been published. The topic of methane hydrate is apparently attracting more attention because an increased number of papers are being published on hydrate (Preface). In the United States, a program of hydrate research led by the U.S. Department of Energy (Chapter 28) attracted the attention of scientists, especially from the Geological Survey of Japan. The similarity of the tectonostratigraphic position of known hydrate deposits, such as those off the west coast of Central America (Chapter 2), suggested the possibility of significant methane hydrate in the offshore area surrounding Japan. Preliminary methane hydrate research and development (R/D) studies were begun on a small scale over in the late 1980s by government institutions, such as the Geological Survey of Japan. The objective was to examine and define the likelihood of the occurrence of methane hydrate around Japan. In response to a June, 1994 advisory report of the Petroleum Council of Japan, acting as chief advisor to the Minister of International Trade and Industry, the Ministry of International Trade and Industry of Japan (MITI) initiated a project in 1995 to evaluate methane hydrate around Japan. The report pointed out that methane hydrate, as an unconventional natural gas resource, might be the most important indigenous energy resources remaining to Japan. The advisory report recommended a first five year program of basic survey and research focused on oceanic hydrate around Japan to better understand the resource potential and future commercial possibility. The Japan National Oil Corporation (JNOC) was given the task by MITI of coordinating domestic exploratory work. The study of potential pipeline hazards was carried out by private gas distributors. MITI-JNOC's exploration surveys on oceanic methane hydrates focused on determining whether such hydrate could be an energy source in the future. 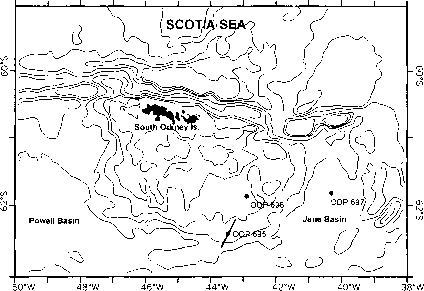 MITI and JNOC were given the resources not only to carry out research and survey activities, but also to drill at least one wildcat well on a potential hydrate deposit, not only to evaluate methane hydrate and associated free gas, but also to explore for conventional subjacent hydrocarbons. From a methane hydrate exploration point of view (Tono, 1998), the objectives of drilling must be to clarify the origin of seismic features regarded as revealing the presence of hydrate, to evaluate associated free gas below, and to collect basic data which would help to confirm the possibility of economic concentrations of methane hydrate adjacent to Japan. To promote this program, in 1995, a Methane Hydrate Development Promotion Committee was established within JNOC. This body consisted of researchers and engineers from universities, national research institutes, oil companies, and gas companies. JNOC's Technical Research Center (TRC) has conducted collaborative studies on methane hydrate with ten private companies in Japan since 1995. In order to carry out initial drilling of at least a stratigraphic exploratory well in 1999 and to examine the possibility of the development of methane hydrate in the future, a research-industrial consortium was established. The group consists of four Japanese oil exploration companies, two service companies, three gas companies and one electric power development company. The TRC research and development project includes examination of at least six practical fields such as basic properties of methane hydrate, geotechnical modeling and logging technology, seismic survey and processing technology, drilling and coring technology, production modeling and core testing technology. Four main fields of investigation comprised the basic hydrate research program of Japan. 1. In the first instance, the database for naturally occurring hydrate it very sparse. Data were needed to understand the basic elements of methane hydrate origin, occurrence, and formation, particularly with respect to its effect as a diagenetic material in different types of sediment. 2. Commercialization of the hydrate resource would involve disturbing a natural system that is reactive to changes in temperature and pressure. Therefore, understanding the reaction of the hydrate system as a whole (Max and Chandra, 1998) is important to minimizing hazards and possible effects upon the environment is critical to exploitation of the hydrate resource. 3. Once the methane has been extracted, storage of methane and transport of the methane to the points of use will be on a far greater scale than at present. Because of both the safety and possible impact upon climate of major methane spills, tolerance for mishandling the methane must be minimized. 4. Most important of all, however, to the possible development of oceanic hydrate as a source of methane is the need to develop survey, experimental, and intellectual tools to allow the proper assessment of the three-dimensional disposition of hydrate and determine its volumetric concentration. At the beginning of 1998, the hydrate consortium also conducted methane hydrate research-well drilling in the Mackenzie Delta in Canada (JAPEX/JNOC/GSC Mallik 2L-38 Research Well) under a collaborative research program with the Geological Survey of Canada (GSC), the U.S. Geological Survey, and universities and research institutions (Chapter 5). Even though the well was on land and in permafrost rather than in an oceanic environment, it was felt to be important that emerging technology and methodology thought to be important to recovering methane from hydrate would be tested in a realistic hydrate environment. In particular, work was carried out to verify new deliverables from the research and development arena, such as the Pressure Temperature Core Sampler (PTCS) and drilling fluid technology, as well as conducting core sampling, wireline logging, VSP and production testing. The first five year program has been successfully completed in that evidence of substantial hydrate immediately adjacent to Japan has been found and sufficient is now understood about hydrate to continue the hydrate research program. The character of the second five year segment of the program has required altering the structure of the program's organization to focus more on resource development rather than research. It is anticipated that in the near future, during the first decade of 21st century, the term "Recoverable Reserves" may be applied to hydrate deposits adjacent to Japan rather than the initial "Expected Resources" (Tono, 1998).